Dr. Andrea Natale accepts the 2018 Star of Texas Healthcare Award at the PTV Investor Meeting Wednesday, September 26, 2018. Austin, TX – October 17, 2018 – PTV Healthcare Capital announced today that Dr. Andrea Natale, a dedicated clinician, innovator, and researcher in the field of electrophysiology, has been awarded the 2018 Star of Texas Healthcare Award. 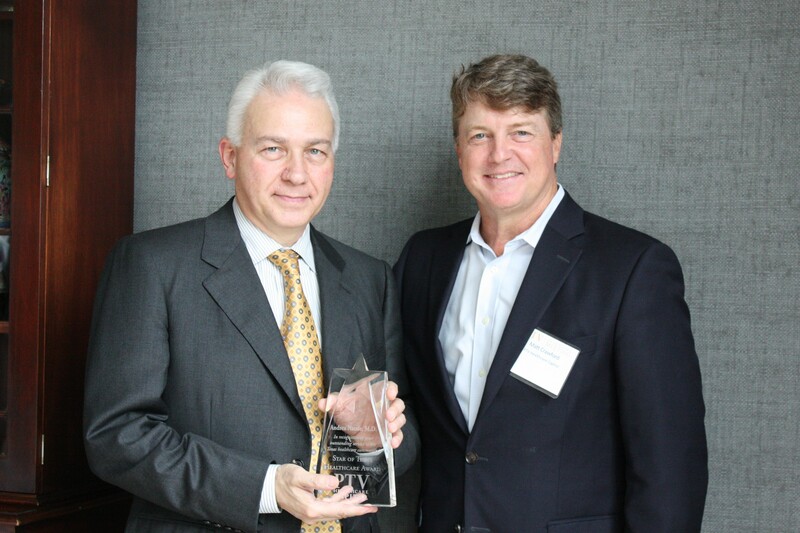 Dr. Natale accepted the award last month at PTV’s 2018 Investor Meeting in Austin, Texas. For the past eleven years, the Star of Texas Healthcare award has honored healthcare professionals and outstanding members of the Texas community for their commitment to healthcare improvement and innovation through either professional achievement or outstanding philanthropic service. Previous recipients of the PTV Star of Texas Healthcare Award include Dr. Charles Stasney, a world renowned clinical otolaryngologist of Performing Arts Medicine; Dr. Stephen Slade, a pioneer in the field of LASIK and refractive eye surgery; On-X Life Technologies, a leading manufacturer of mechanical heart valve replacements; Mack Brown, Former Coach and Co-Founder of MJ&M, a joint fundraising effort focused on empowering kids, John Mendelsohn, MD, Ex-President of the MD Anderson Cancer Center; Steven McKnight, PhD, Professor and Chairman of the Department of Biochemistry at the University of Texas Southwestern; Francisco G. Cigarroa, MD, Chancellor of the University of Texas System; James T. Willerson, MD, President and Medical Director for the Texas Heart Institute; Julio C. Palmaz, MD, inventor of the first commercially successful coronary stent; and Mark McClellan, MD, PhD, former Commissioner of the US FDA for Medicare and Medicaid Services. Andrea Natale M.D., F.A.C.C., F.H.R.S., F.E.S.C., is the Executive Medical Director of the Texas Cardiac Arrhythmia Institute at St. David’s Medical Center, where patients from around the world seek treatment from him. A forefront researcher, Dr. Natale focuses on innovative advances in the treatment of atrial fibrillation. His goal is to benefit patient care through technologies such as robotic devices and specialized ablation catheters. Dr. Natale served as a principal investigator of PTV portfolio company Cardiva Medical’s AMBULATE pivotal trial, a randomized, multi-center study which was completed in May 2018. Twenty-nine physicians enrolled 204 patients in the AMBULATE pivotal trial at 13 sites across the United States, which evaluated Cardiva’s VASCADE MVP System compared to manual compression for multi-access, catheter-based procedures such as cardiac ablation for atrial fibrillation. The goal of the trial is to demonstrate significantly reduced time-to-ambulation for patients following these common and high-growth electrophysiology procedures. Dr. Natale has held—and currently holds—faculty positions at a variety of prestigious universities, including Duke University, Stanford University and Dell Medical School at The University of Texas at Austin. He has been an invited speaker at hundreds of symposia and conferences around the world, and he has authored numerous published articles on pacing and electrophysiology in high-impact, peer-reviewed journals—in addition to serving on the editorial boards of several major medical journals. Congratulations to Dr. Natale on this well-deserved recognition! PTV Healthcare Capital is an Austin, Texas based venture capital and growth equity firm dedicated to enabling healthcare entrepreneurs and global innovation. Founded in 2003, PTV is comprised of a highly collaborative team of professionals, deeply experienced as investors and operators of life science companies. PTV focuses on mid-to-late stage companies with comparatively low technical, regulatory, and financial risk that are “with the grain” of healthcare economics – improving patient outcomes while decreasing costs – in markets with significant unmet clinical needs. To learn more, please visit www.ptvhc.com.